BedBand’s are bed sheet and cover holders made in the USA and assembled by American workers. Designed to make bed sheets and bed covers fit better. Jamie Whaley CEO Bed Band Store LLC was determined to solve the problem of “loose sheets” she was experiencing in her home. Jamie says after purchasing several types of “sheet holder” products, she held on to hope that “one of them would work.” Well, none of them seemed to work very well. Frustrated, she made a list of how she could improve all of those failed “sheet holder” designs and decided to make one that actually worked, that’s when the BedBand was born. If you have experienced long nights and sleep loss due to your sheet slipping off your mattress and wrapping around your feet…..however, there are many people out there suffering from the same problem Jamie and her husband did. More than just a nuisance….it may affect a person’s well-being. The “BedBand” solves a problem caused by an industry gap created by the many mattress options available and the sheet industry not evolving beyond their “standard size deep pockets” bedding. 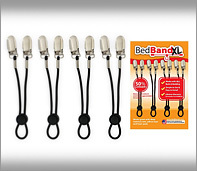 BedBand is different than other “sheet holders” on the market in several ways. The first and most noticeable difference is….. it actually works. BedBand is a USA product 100% Assembled by American Workers and was the first product in the bedding accessory category to utilize shock cord instead of flat strips of elastic. There is no lifting required. It is simple to install and adjust and BedBand is backed by a lifetime warranty. OnlineBedStores.com (OBS) recommends “BedBand’s” and the bedbandstore.com because they are a small independent company that has tremendous passion for their products and are available by phone to answer your questions. OnlineBedStores speaks to every company we recommend to our visitors and we ask for nothing in return, other then, that our recommended retailers service every customer, to the best of their ability.